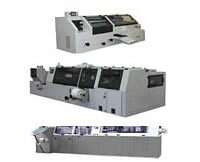 Founded in 1999, IBIS Bindery Systems is a world-leading supplier of high-speed digital book finishing systems. The IBIS Smart-binder Plus HS can produce personalized, variable page-count wire-stitched, cold-glued, or perfect bound books from a digitally-printed web, or from cut sheets. It is used at print sites around the world to produce personalized booklets for school examinations, health care, financial, insurance, government, manuals and many other applications. Our IBIS engineers have over 300 man-years experience in print finishing. We specialize in the integration of high-speed booklet systems with continuous web digital printers, and in configuring complete digital book finishing systems for turn-key operations with a high degree of customization. We have over 140 IBIS Smart-binder systems operating at customer locations worldwide. Our products are backed up with first-class customer training and support. We are proud of our long-standing and continuing partnerships with all of the major continuous inkjet printer manufacturers, and digital post-press suppliers. Our focus has been on finishing solutions for high-speed CF (web) digital printers, both off-line and in-line. Uniquely, we offer the ability to produce both glued books and wire stitched (stapled) books from the same machine. We also have extensive experience of integrating different equipment into complete customised systems. In this way we provide a one-stop service for book finishing solutions. All our products are backed by first-class customer training and support.We are based approximately 30 miles (48 km) from central London and close to Heathrow international airport. The IBIS senior management team and founding partners include three Oxford and Cambridge engineering graduates. 33 years experience of book-binding machinery design and supply, including 20 years as Engineering Director with Heidelberg, AM and Harris. Commitment : We are committed to bringing success to our customers. Openness: We communicate honestly and frankly. Integrity: We conduct ourselves correctly and deliver what we promise at all times. Technical excellence: We take pride in high standards of engineering and providing maximum benefits to end-users. 25 years experience of Print Finishing, specialising in system controls. 27 years experience of book-binding machinery manufacture and supply. 1999 (May) John Cracknell, Mark Firth and Malcolm Allitt form IBIS Integrated Bindery Systems. The new IBIS engineering team design its first in-line digital-finishing product. 1999 (Oct) IBIS signup to an exclusive sales contract agreed with Océ Printing Systems, Munich. 2000 (April) The first IBIS 'Digi-stitcher' (the worlds first high speed in-line digital saddle-stitcher) is installed at The Stationery Office, London, to make stitched documents in-line with an Océ high speed web printer. This system produces The London Gazette and other documents for the UK government. 2000 (May) Drupa, Germany: The Digi-stitcher DST2 is launched to the world market at drupa in Düsseldorf . 2001 (Sept) IBIS moves into its new headquarters in High Wycombe UK. 2003 (June) Following worldwide success with 40 Digi-stitchers installed with Oce printers worldwide, IBIS opens up sales channels to other printer manufacturers in addition to Océ. These include IBM and Xerox. 2004 (May) The new IBIS Smart-binder SB-3 digital saddle-stitcher is launched on the Océ, Kern & Xerox stands, featuring IBISs patented Individual Sheet Gluing (ISG) binding system. 2006 (May) IPEX, UK : Xerox and Delphax show the Smartbinder SB-4 which can produce saddle-stitched, ISG glued and perfect-bound books all in one system. 2012 (May) Drupa , Germany: IBIS launches the higher performance Smart-binder Plus saddle stitcher and the new 1,500 books/hour Sprintbinder 4-clamp perfect binder. 2012 (June) The first IBIS system with automatic on the run changeover between saddle-stitching and perfect binding is installed at a customer in Rome, Italy in-line with an Océ JetStream 2200 printer at 150 metres/min web speed. 2014 (March) IBIS exhibits a Smart-binder SB-3 Plus HS on its own stand at IPEX in London. 2014 (May) IBIS celebrates 15 years of supplying high-end book finishing solutions for digital print ! 2014 (Sept) IBIS is awarded top marks for exam booklet production, with around 30 Smart-binders producing stitched (or glued) and trimmed exam papers at customer locations all around the world.